(pronounced pah-SEE-yah.) 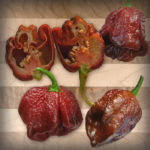 A true Pasilla pepper is the dried form of the long and narrow Chilaca pepper. In the United States, though, producers and grocers often incorrectly use ‘pasilla’ to describe the poblano. Pasillas are used mostly in sauces. They are sold whole or powdered in Mexico, the United States, and the United Kingdom.